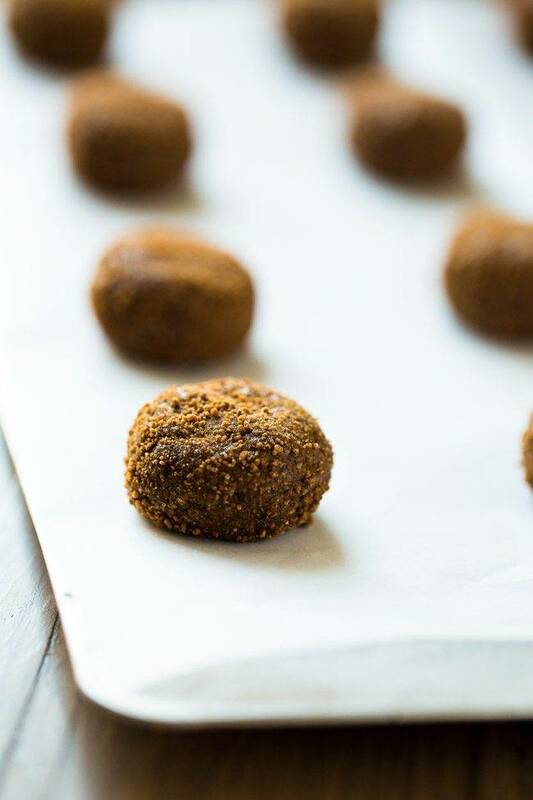 This healthy Ginger Snap Recipe, tastes even better than Grandmas and is quick, easy and Paleo friendly! Perfect for healthier Christmas baking! It’s that time again! Time to team up with my all star blogging ladies to bring you some Healthy, Paleo Friendly Christmas Cookies! I’m excited that Kelly from Nosh and Nourish is joining the holiday fun today! Kelly made you guys some INANELY delicious looking shortbread cookies…I mean, check out the chocolate! 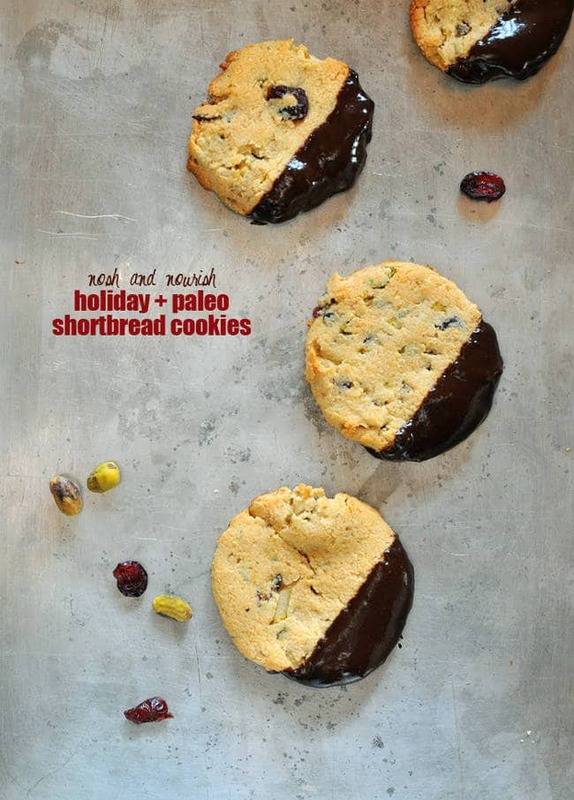 Click to get the Paleo Shortbread Recipe! Davida made you guys a classic…GONE HEALTHY! Totally in awe of the chocolate goodness in these Crinkly Cookies! 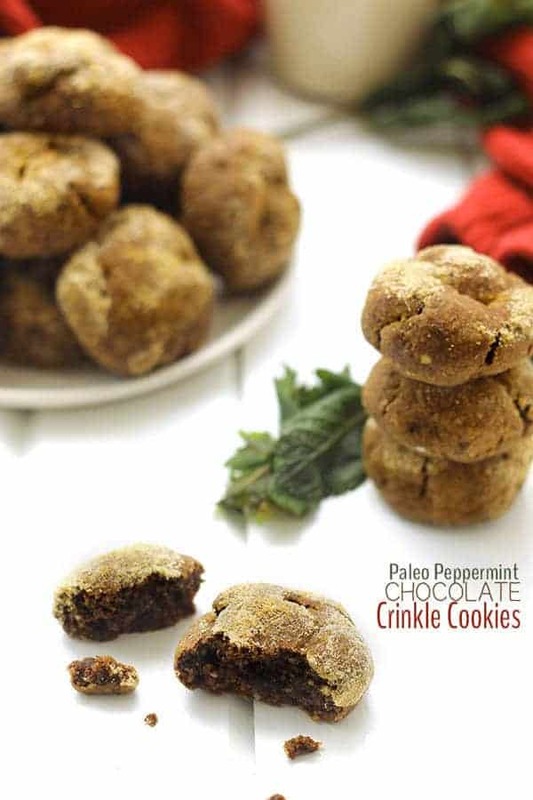 Click to get the Paleo Peppermint Chocolate Crinkle Cookies Recipe! The talented Lee is bringing some more chocolate goodness. We all know hot chocolate is better in cookie form! 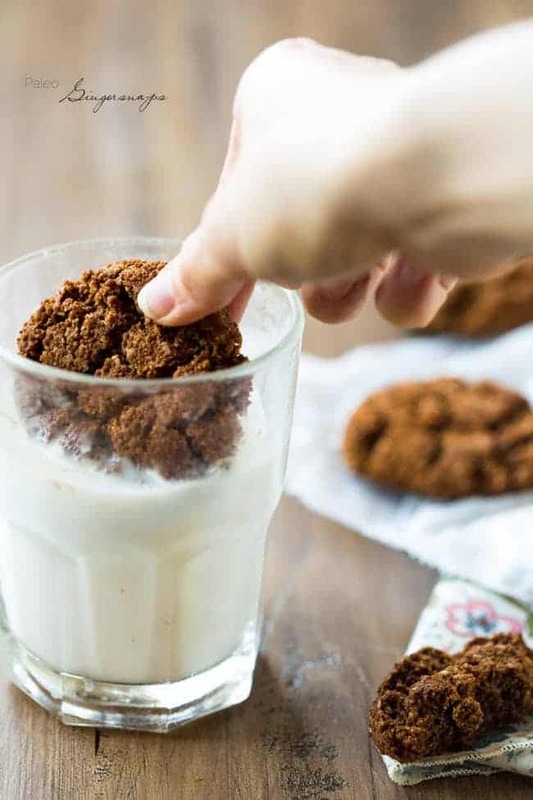 Click to get the Paleo Hot Chocolate Cookies Recipe! Lexi. That girl. She makes her own healthy Nutella! And she’s stuffing it in a healthy cookie for some salty/sweet action! 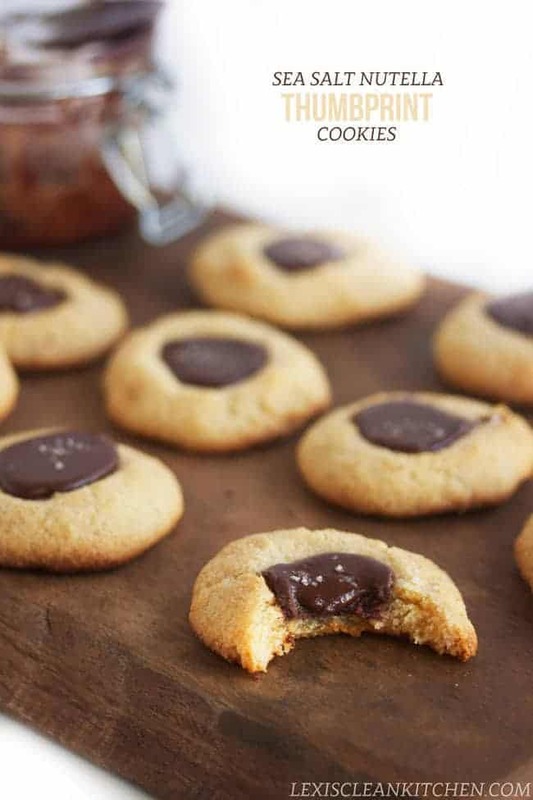 Click to get the Sea Salt Nutella Thumbprint Cookie Recipe! AAAANNND I’m bringing you a classic Christmas treat – the Ginger Snap! I have been trying for YEARS (read: It’s may have only been a few days) to get three AMAZING recipes from my Grandma: her Easy Gluten Free Stuffing, her Paleo Pecan Pie Bars and her Ginger Snap Recipe. As you know, I got the gluten free stuffing and pecan pie bars out her at Thanksgiving. BUT SHE WOULD NOT BUDGE ON THE COOKIES. They’re just HER THANG. Until I told her how it would benefit my blog so much to have a paleo friendly version of everyone’s favorite Christmas treat. And, you guys, I finally did it. No grandma can resist the thought of helping her granddaughter OUT. HOLD UP THOUGH. My grandma did NOT make us any paleo Ginger snap recipes growing up, lemme finish. I got it out of her…and then I changed eryyythang about it. Except they still have Molasses. And baking soda. And salt. I don’t really know why I am trying to, UGH what’s that word?! I CAN’T THINK OF IT RIGHT NOW. Oh yeah, JUSTIFY. I don’t know why I am trying to justify these to you because, well…. That’s the problem with having super hip and urban grandma’s. They know how to read these blog things. Now I’m really not getting any whipped gluten free shortbread cookies. And she is DEFINITELY not making me any sugar cookie recipes. We should move along before I end up being banished to the floor to share kibbles with my puppy during Christmas dinner. Or are you more for the super soft, melty in your mouth, airy bites of sweet kind of gluten free cookies? I can’t lie to you. I usually lean towards option B, HOW-EV-ER, Ginger snaps are the only cookie that I deem it 100% A-Ok to include a snappy, crunchy factor. Especially because they look COOL. I mean, look at all those crevices and valleys. Ginger snaps are like the Grand Canyon of the cookie WURLD. These babies took quite a few tests because I am of the thinking that a ginger snap recipe needs to 1. Taste like ginger. OBVI. AND 2. It NEEDS perfect crackly tops. 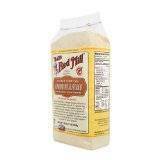 Which was no easy feat without the gluten and general easiness that comes with baking with wheat flours. But, you guys, we got there. And not like the getting there when you’re on a road trip and your parents tell you that WE’RE HERE, but really they only meant that you’re at the gas station pit stop which TOTALLY crashes all your hopes and dreams of EVER getting out of the car. We got there, as in we reached the END GOAL. And it has crunchy, sweet, crackly perfection, WITH my 6 favorite letters. Side note: I just used my fingers to count how many letters that was. Someone shoot me. Now. Mr. FFF is, what I like to call, a pinky-up Ginger snap eater. Which means he is PICKY about his ginger snapety snap-er-oos. He is a regular connoisseur. <— Big word. AND, he agreed that they tasted EXACTLY like any unhealthy ginger snaps recipe out there. He couldn’t even TELL they were good for him. And, in man world, that is basically reaching the cookie mecca. The perfect healthy Christmas cookie! Preheat your oven to 350 degrees and line a baking sheet with parchment paper or a silpat. 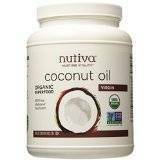 In a large bowl, beat together the melted coconut oil, coconut sugar and egg white until well mixed. Set aside. In a medium bowl, stir together the almond flour, coconut flour, baking soda, salt, ginger and cinnamon. Stir until everything is very well mixed and there are no little clumps of flour. Stir the flour mixture, along with the molasses into the oil mixtures and stir until a slightly sticky dough forms. Place the dough into the refrigerator for 10 minutes, just to allow to coconut flour to absorb some of the moisture. Once the dough has chilled, Roll 1 Tbsp sized balls and roll the balls around in coconut sugar. Place onto the prepared baking sheet and slightly flatten down. Bake until the edges begin to go darker brown and top is nice and crackly, about 19-20 mins. (SEE NOTE ***) The cookies will feel VERY soft, but they will crisp up A LOT once cooled. Let cool completely on the pan and then DEVOUR. * I know the measurements are very exact, which is why I HIGHLY recommend using a scale to weigh your flour. Due to varying sizes of measuring cups, you may get a different amount, causing your cookies to not be as perfect. **Parchment paper is VERY important here. If you don't use parchment paper, your cookies will NOT come off the pan. *** I baked my cookies on a light colored baking sheet. I also tested them on a dark baking sheet, and they only took about 10-11 minutes. So watch closely for the edges to begin to darken. AND, Don’t forget to enter My Favorite Things Giveaway AND The Adobe Creative Cloud Giveaway! These cookies look gorgeous, Taylor! The gingersnap looks like the ultimate cookie, I love how thick and full of flavor it is! Perfect to dunk in some milk. Pinned! The milk is KEY! 😉 Thanks Gayle! They are so easy Matea! Thank you! I can never resist a cookie! I love that these are paleo too. They look amazing. I’ll take a dozen, please! I’ve been Paleo for a year now , so I have not been able to enjoy a cookie . I tried this recipe, and loved it !! My husband can’t stop eating them ,and he is not Paleo . Thank you ! Oh my gosh YAY! I am so happy to hear this! Just so you know I have a new twist on this recipe coming out on Wednesday 🙂 Thanks for letting me know! Wow, I’m coming to your house! BTW, even as a chocolate lover, I think gingersnaps are a MUST for the holidays, love them and yours look fab and fit! These look INCREDIBLE Faith! I have a family member on a gluten and diary free diet coming for Christmas dinner…and I’m making these!! I love gingersnaps. Frozen. Yep. Frozen!!! THAT SOUNDS AWESOME!! I need to try! FABBBBB recipe and photos. PER USUALLLLL. 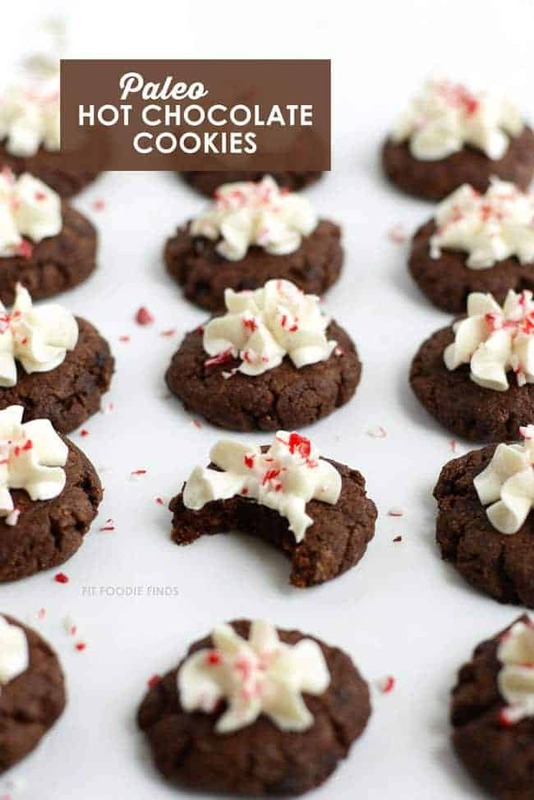 I’ve actually never made gingersnap cookies….so this would be a good one to try. Maybe as the cookies in an ice cream sammich?! YESSSSSS to ice cream sammich. I love how your brain works, thanks friend! I’ll try yours if you try mine 😉 Thanks girl! Hey, it’s Christmas..it’s all good 😉 Thanks girl! These look tasty! I have been trying to eat more Paleo-ish lately so these will be great for me to try! I hope that you love them – thanks Betsy! Haha, you crack me up!! 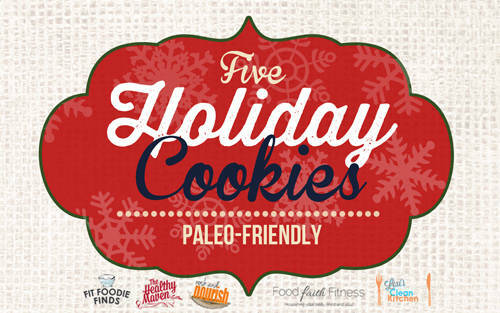 And these cookies look absolutely delish — and paleo?!?! You go girl. I lurve you! Thanks Kel! These look insanely delicious! Yum! 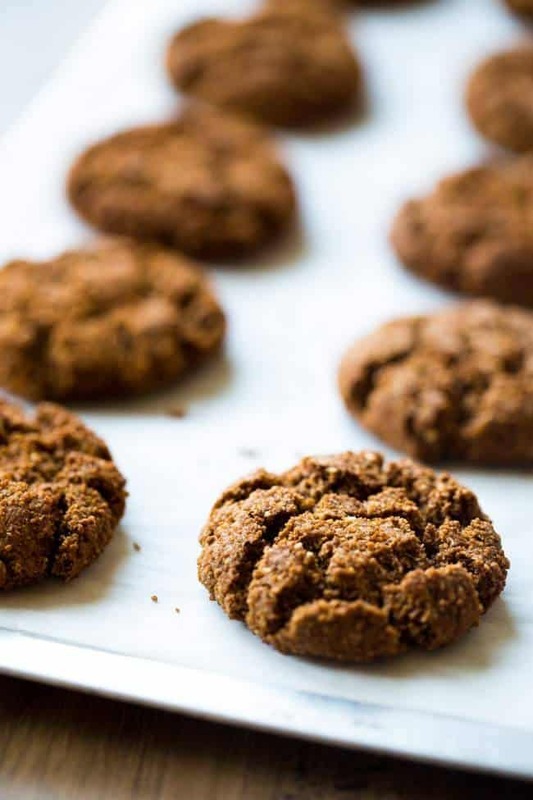 I am learning that I loooovve gingersnap cookies…really anything with ginger and molasses. So making these and having some with my coffee. Pinned!! Thanks for the love and pin Cyndi!! I love crunchy sweet gingersnaps! These look amazing – you totally nailed it with all those pretty cracks! Love that they are paleo! I was in need of some gingersnap cookies recently for a pie crust so I bought some at the store. Ach! Don’t tell anyone I did that. Anyway, they were awful. I mean, they were fine crushed up as a pie crust. But as a stand alone cookie? Not so much. I’m SO glad to have this recipe and can’t wait to dig in! They look awesome, I love a good gingersnap around the holidays! You and me both! Thanks Sylvie! 😀 Happy Birthday! 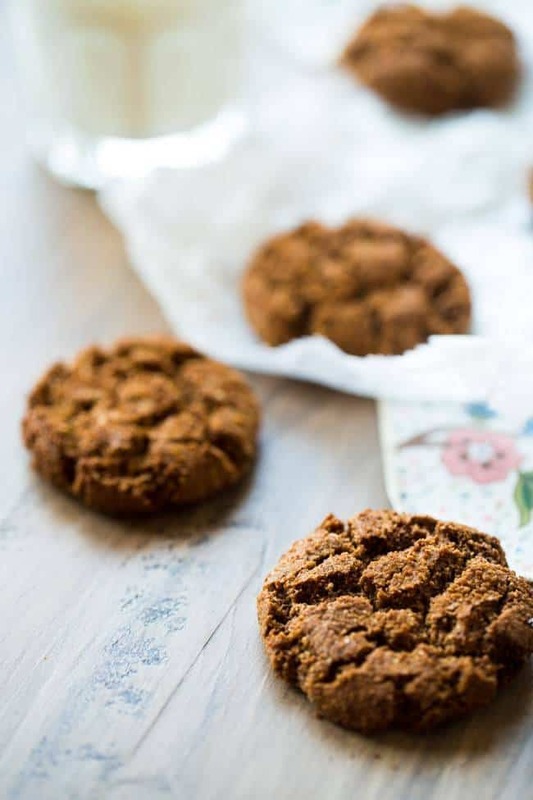 I am obsessed with gingersnap cookies and even though I still have molasses in my hair from experimenting with granola, I’m dead keen to give these a go! Maybe Grandma FFF can forgive you. Haha…hey, you could totally start a new trend right!! I hope she does, it ain’t Christmas without her cookies! Thanks Arman! Lookit these things! I want every last one of them. Any time I see/hear the word, “paleo,” I’m all, “I’muh eat the whole thing,” because: healthy. So these cookies wouldn’t last but 3 seconds in my house. Love the gingersnap, girly! Very tasty looking indeed! So freaking good!!! Kinda funny I jut posted a gingersnap cookie too but I am totally going to have to try your variation. They look delicious. Your cookie line up is amazing! I think Gingerbread are one of the top holiday cookies.Just the smell…so holiday-ish.. They smell is AWESOME right?! Thanks Chrysta – I totally need to check yours out! That cookie in milk shot … truest photo I’ve seen! I didn’t even know I liked ginger snaps until ummm about a year ago, and now I’m obsessed! I HAVE to try this!!!!! P.S. Were these taken with the new camera/lens??? I sense some macro action up in here! LOVE!!!!!!! You totally need to try these if you’re a snap fan! Healthy and yum! o.K….I was ALL IN ! with that picture of the cookie in the milk! yum! I have to make these..pinned! Looks wonderful! I can’t wait to try them! Gingersnaps are my favorite! Aren’t they so tasty?! Thanks Tammy! Lovely cookies! I just made vegan gingersnap cookies last weekend, but this weekend I may have to try these ones! I’ll try yours and you try mine 😉 Thanks Laura! 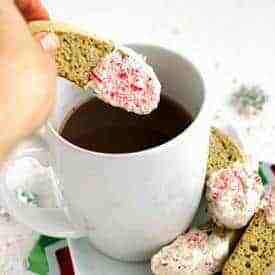 I love ginger snaps at Christmas, although I’m in the soft and chewy camp. Although I wouldn’t turn down a crispy one! I am generally with ya, but hey, a cookie is a cookie 😉 Thanks Stacey! These gingersnaps look wonderful. Definitely going to have to share this with my sister in law who loves my gingersnap recipe but has recently gone mostly paleo. And I might just have to do a hybrid of the two. Taste testing- my favorite perk. Right?! Taste testing is the best 😉 Thanks Melinda! 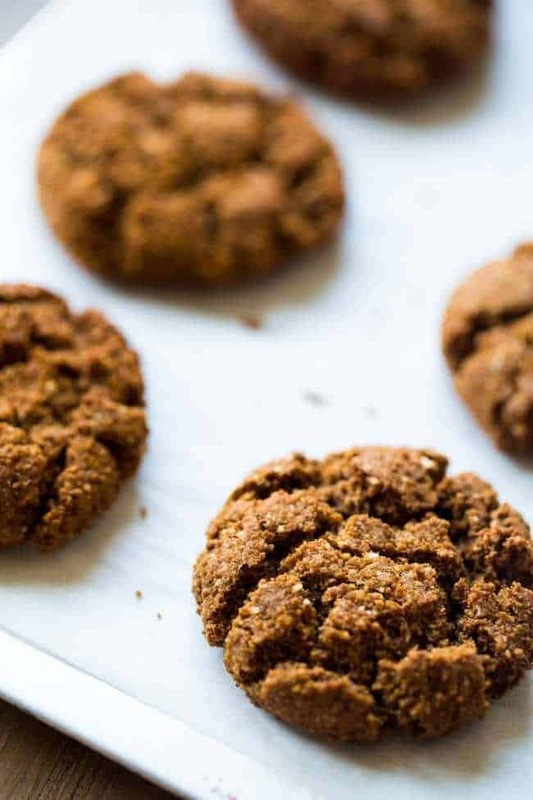 These delicious ginger snap cookies are definitely going on my holiday baking list. I love how healthy yet delicious they are – so much better for you then the usual unhealthy Christmas cookies circulating at the moment! Right?! I am all for healthy and delicious! Thank you! Yay! So happy that you found something you can make! Thanks Eric! Those crackles look AMAZING! Pinning! Thanks for the love and pin Julia! Totally delicious! Such a great Christmas treat! Thanks for linking up with What’s Cookin’ Wednesday! Yay! I so hope you love them! Thanks Dionne! Please let me know how they turn out! Aaaaannnnnnd now I am reconsidering my decision to skip on cookie baking this Christmas…. I think that is a verrrry wise choice 😉 Thanks lady! I am really exited to try this ginger snap cookie recipe!!! Yay! Please let me know how they turn out! Thanks Dawn! Healthy cookies?! Yes, please! Pinning this. I also wanted to tell you that I just found your blog through SITS girls link up. It’s just lovely! I look forward to following. Thank you SO SO much Tricia! I hope you love them and find more recipes that you love! I hope that you had a great weekend! All of these look wonderful! Healthy cookies that taste great are the best! Pinning! I am glad you agree! Thanks Michelle! Your cookies always look so delicious! It must be healthy gingerbread week, because I did paleo gingerbread donuts! We must be on the same brain train! Thanks Jennifer! 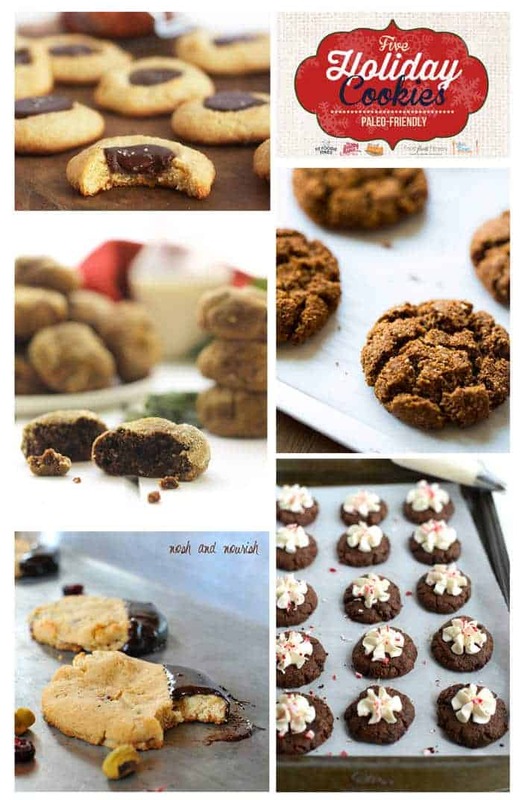 Taylor, love all of these paleo-friendly cookies!! and congrats to you for making the perfect crackly tops on these awesome ginger snap cookies!!! ginger snaps are my fave christmas cookie!! and maybe you can make these for your grandmother? 🙂 Happy holidays!!! Maybe I CAN! Thanks so much for the love Alice! I pinned this when I first saw it – just pulled them from the oven…spectacular!! 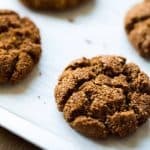 I love ginger snaps & these are the best I’ve ever made. Thank you for a great recipe! Have to tell you that the texture the next day was still great! I often find gluten free baked goods lose their texture (usually turn soft) so quickly & I don’t like that. On another note – I was on Foodgawker today & saw a recipe almost indentical to yours. Not sure how that works, but it was so close I thought it was the same recipe at first. Thank you bringing that to my attention! I found it on Foodgawker, and you’re right. Unfortunately, it does look way too similar to mine… Thanks again! These look amazing!!! We’re on GAPS (and thus, limited to only honey as a sweetener,) do you think I could sub honey for the sugar here successfully? Unfortunately, you really can’t 🙁 Baking with nut flours is so temperamental and the liquid ratio is important, and honey would add too much liquid – I am so sorry!! But thank you! Love that these are Paleo, going to make a batch to take over to my sisters on Christmas Eve. This is in the nick of time — my daughter arrives home this weekend and she and her boyfriend are eating Paleo these days! Perfect! I hope she loves them! I just made these, and they’re so yummy! Thanks for this recipe, Taylor! YAY! So glad to hear that -thank you! YAY! I am so so glad you like them!! These. are.amazing! Seriously, we made 7 different kinds of cookies for Christmas and my husband and I both picked this as our favorite. The kids, not as much…but I think they just don’t like ginger stuff. I don’t eat cookies, or really sweets in general, but these have me hooked. Such a unique taste! Any idea on the nutritional counts on these things?
. Because trust me, I could eat the entire batch myself in one sitting. Holy smokes. Yay, I am SO SO glad you love them – you made my day – thanks! Unfortunately, as I am a recovered anorexic and counting calories is a trigger for me, I don’t allow myself to calculate nutrition – I am SO sorry! But http://www.myfitnesspal.com/ may help you! Thanks again! These look delicious!! 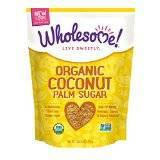 I’m wondering if I could sub the coconut sugar for Splenda brown sugar as my husband is diabetic. Always on the hunt for grain-free, dairy free & sugar-free recipes. To be completely honest, I really don’t think they would turn out the same. However, I can’t say for sure as I haven’t tested it myself! I think it would taste good, but the texture would be off, as Splenda doesn’t make things as tender as real sugar. I hope that helps! I’m sorry! If you do try, please let me know! 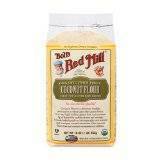 Is there something else I can use in place of coconut flour? Having an extremely hard time finding it in my area! Unfortunately, coconut flour does not react the same as anything else in baking, I am sorry!! Have you looked online? Or in bulk food stores? That is where I get mine! At Winco. Just made these gingersnap cookies and they are AWESOME! I like mine less crispy, so baked them for 10 minutes, and let cool 1 minute before removing to a cooling rack. I used a silicone baking sheet instead of parchment paper and they turned out perfectly! I weighed the ingredients as suggested (on a really old scale). Since I’ll be making these often, I asked for a digital scale for Mother’s Day! 🙂 Looking forward to looking at your other recipes as this is the first one I’ve tried. I am so glad you love them! And thank you for weighing the ingredients, it really makes a difference!!! 🙂 It’s so great to have you here, and I hope you find more recipes that you love – please let me know!!! I hope your weekend is great Sandy! I used regular organic cane sugar in place of coconut sugar, but it was still nothing short of delicious. I cooked it for 18 minutes to get them perfectly done. Sosososo good! I highly recommend this to anyone. Yay, I am SO glad you loved them! Thank you for letting me know! I tried these tonight! YUM!! 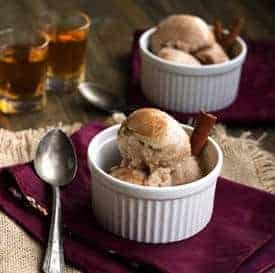 I’m a video blogger and I am going to make a video of the recipe to share with my friends- thanks! I made these cookies exactly as written and they were super easy to make AND they taste amazing. Woo hoo! I am SO happy to hear that Donna – thanks so much for letting me know! Thanks so much Michelle, I’ll be sure to share! Have you ever tried rolling out the dough? I want to make gingerbread men and this recipe looks divine! Hi Lis! I havent! My gut tells me it wont work because, as you can see in the photos, like all good gingersnaps these cookies have crackly tops. I think your men might be crackly! Plus, I’m not sure how “roll-able” the dough is. BUT, if you do try it, PLEASE let me know!! Thanks and Merry Christmas! I just made these! They are so legit! This is my first grain-free Christmas, and I was preparing myself to never have a wonderful gingersnap! But luckily, I can barely taste a difference in these from my moms normal recipe. I would like to add however, I think you should include with the baking time the information about the dark baking sheet… or specify because sadly I didn’t see the dark baking sheet instructions until I was 2/3 through baking the batch. I noticed it was too much time, so I reduced it, but it still wasn’t enough. So, just a thought 🙂 Thank you for this recipe! I will do that – great idea! and I am SO glad you love them yay!!! Merry Christmas! Thanks for catching that! It’s teaspoons! 😀 Let me know if you try them! Perfect! I appreciate the quick reply. I’m making these today for my mom as part of her Christmas gift. I’m sure she’s going to love them! I figured you were so I wanted to get to you! 🙂 Yay! Let me know please – Merry Christmas! So glad I found this recipe! It’s delicious! And I may or may not have bought a kitchen scale last night at the grocery store specifically for these cookies. I really, really wanted them to turn out … and they did! I’m curious how I should store them. I don’t want them to lose their crispness. Any tips on that? I am SO SO happy that you bought a kitchen scale! Seriously, they are SO key to gluten free baking! I’m also SO happy you love the recipe – yay! Thanks for letting me know! I haven’t made these in awhile but, if memory serves me right, they stayed pretty crispy just in an air-tight container on the counter! I THINK they would also stay crisp if you froze them and then took one out to thaw at room temp when you wanted to eat one? You could try freezing one to see? I hope that helps! OH.MY! I made these cookies last night & they are SO DELICIOUS! They came out perfectly – crunchy on the outside & soft on the inside and only took 10 minutes to bake so you really do need to keep an eye on them while they are in the oven. If I hadn’t baked these myself, I would never know they are good for you. This recipe is definitely a keeper. No waiting for Fall or Christmas for these yummy cookies in my house! Thank you, Taylor! 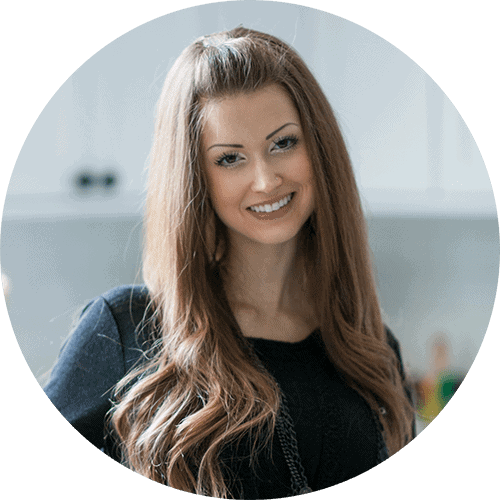 I’m just starting my Paleo journey & immediately bookmarked your site. I’m a fan for sure! I am SO happy that you loved these as much as I do! Gingersnaps are TOTALLY not just for Christmas anymore…I say eat them all year round! Thanks for the recipe Taylor. Whole family is enjoying them. My 9 y.o. who helped me roll them (turns up for the best bit) even set the table with candles for “dessert”. Mine took a bit longer to cook, but I think that’s just my oven. That is SO cute that he set the table with candles, I love it! Yeah, I think my oven runs a little bit hot, but I am so glad you love them! Thanks for letting me know! Taylor, I’m sure I will try these with or without the egg white. However, I was wondering if you know or have heard from anyone if they would turn out okay using a chia or flax egg instead? I am not supposed to eat eggs, but grain-free (not supposed to eat wheat, barley, or rye either) ginger snaps are really tempting! I’m happy to have found your blog. Thanks! I am happy you’re hear Tammy! I have not heard of anyone having luck with chia or flax egg and I really dont think it’s going to make them nice and crispy. I’m sorry! WOW! These were GOOD! Perhaps I set my expectations too low with most new recipes, but the comment about the cookies tasting like “normal” ones was enough to go through the effort of making them. IT WAS WORTH IT!!! My 9 year old’s comment was that he can’t believe the recipe came out in 2014 and we didn’t make this earlier! We don’t have coconut sugar so I used 3/4c brown sugar and 1/4c white sugar as a substitute for the coconut sugar. Everything else was the same. I think these might be the best cookies I’ve ever had (of ANY cookies!) and will certainly be a go-to treat when we’re supplying dessert for our grain loving friends. Baked on a dark cookie sheet on parchment paper and they were done in 10 min! YAYYYYYYYYYYYYYYYYYYYYYYY! I am so excited to hear all of this Quinn!!!! SO pumped that you love them!!! 😀 thank you HEAPS for sharing!!! These were AMAZING! Haven’t baked too much since going Paleo, but these made my fall. They are the perfect cookie to go with a cup of coffee or chai. Just made these and am waiting for them to completely cool! How am I suppose to wait from devouring them already?!!! Thanks for the recipe…can’t wait to dunk them in my coffee! 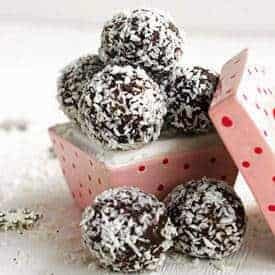 Would these work with coconut flour only? I have an almond allergy. They look delicious! I’m sorry but definitely not – they are completely different! Thank you Taylor! These cookies hit the spot. Because I was in a hurry to get these gems in my mouth, I did use a whole egg. They turned out delicious!!!! Well that is good to know!! Thank you for letting me know and I am glad you love them!! This was a amazing snack.I made it few times.But its a favorite of me.Really liked it. I am SO happy to hear that! Thanks for letting me know! Hi Taylor I am loving your recipes and trying one per week… I tried the pumpking cookies last week and they tasted really delicious just the texture wasn’t so good… I think my measures are not so good, I epuld like to know if you can help me, I am not finding on the internet what would be rxectly 1 1/2 cup and 1 3/4 tsb.. for me folowing recipes in english are a little diffcult, since is not my birth language… O really would appreciate if you can help me to find, maybe in grams? I am so glad you’re enjoying the recipes! Are you using a food scale for your flour? That is SUPER helpful and key – the recipe gives you ounce measurements, and your scale should do that. Does that help? Can you substitute butter for coconut oil? Looks delicious! PROBABLY! But, I can’t tell you for sure as I have never tried it, and have no way of knowing. Let me know if you try! I litterally never wanted to punched someone in the face so much as I did the Author. I just wanted the recipe not your life story. You try to hard to act ~cute~. Literally no one cares. I’m sorry it had to be said. Now these cookies better be amazing. This is a food BLOG which, by definition, is a story. Feel free to scroll to the bottom and bypass the blog part of food BLOG if you’d like. Thanks! This recipe is delicious. I wanted to use the alternative ingredients I already had on hand so I did a little flour research and replaced all of the flour with 3/4 coconut flour (Baker Josef’s Organic Coconut flour). My guess turned out to be perfect! A lovely surprise. For this recipe I would reduce the salt a bit – maybe my changes caused them to taste a little saltier. I used just organic cane sugar but will try some coconut sugar next time. I added 1/8 t. ground cloves. I baked them for 15 minutes which was too long and next time will check at 10. Thank you so much. Oh my gosh these are awesome! I never find a recipe any more that I don’t have to tweak! Thank you! These were amazing, however one question! So I can’t tell you for sure as recipes are only tested as written! But try it! I think that would definitely make ’em crunchy! Let us know if you do! WOW, these are soooo good! Wonderfully crunchy and perfectly spiced. Lovely with a cup of tea. Thank you for adding some .gingersnap love to my life.